To Thais, "upcountry" is any place in the country that's not Bangkok, whether it's north, south, east or west of the capital. The term is sometimes used disparagingly in reference to anyone the speaker deems a bit of a bumpkin (as in, "What do you expect, she's from upcountry." 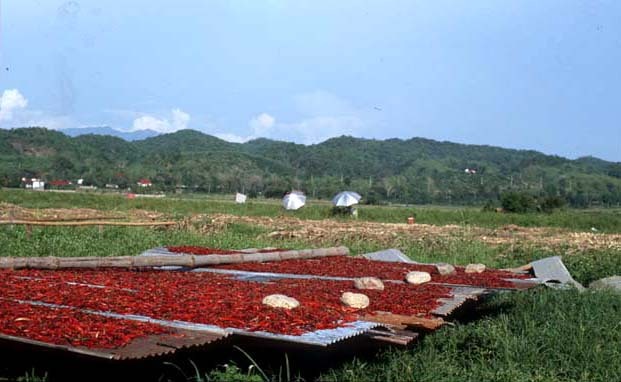 <haughty sniff>), but in my opinion upcountry in Thailand is a wonderful place to be because the pace is slower,people are even friendlier than they are in Bangkok, and there's always something delicious - and oftentimes new - to eat. We're touching down in Chiang Mai, but after picking up a car we'll be spending most of our time here and here. Both are beautiful, blessedly undertouristed provinces. 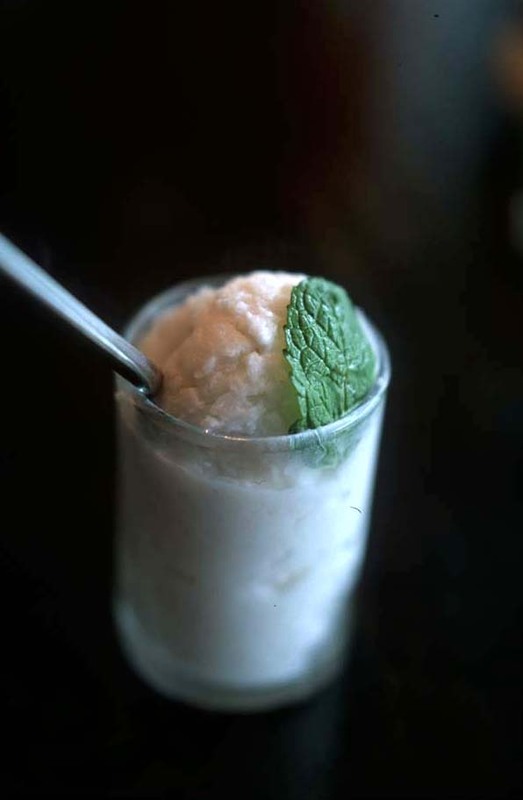 We'll be enjoying the clean air and wide open spaces, the fresh, cool nighttime air and, of course, local specialties. And we think we've made contact with at least one person who can get us into a local kitchen or two to see what's usually done with all the unfamiliar market vegetables we saw on our last trip, in the markets. See you back here after February 7. 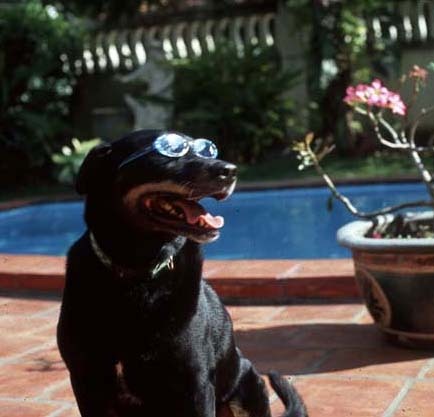 Happy Year of the Dog! Gong Xi Fa Cai! There's only one thing that might motivate me, on a holiday, to roll out of bed before dawn, and if you're a regular reader of this blog there's no need for me to fill in the blank. And so it is that the wee hours of the second-to-last day of 2005 found Dave and I rubbing our eyes and chugging caffeinated soda while hurtling along the North-South highway. Our motivation? 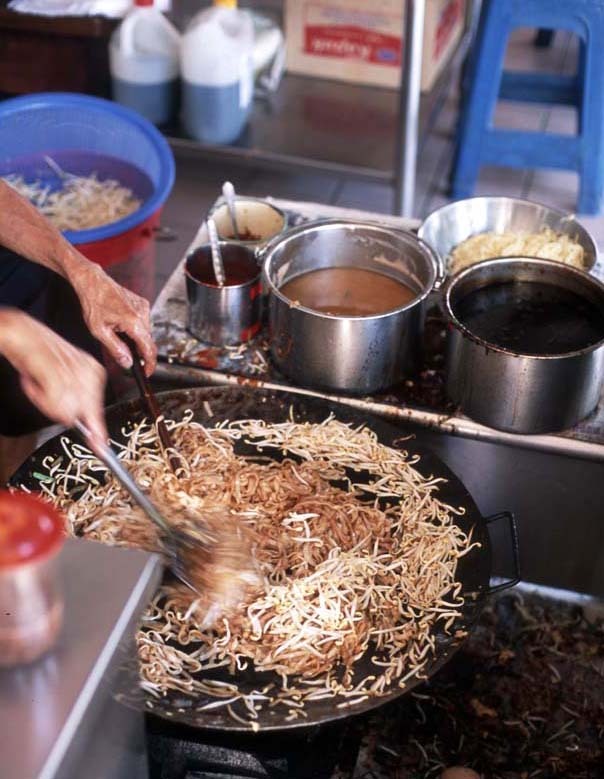 A tip from C that char kuey teow prepared the old-fashioned way, over live charcoal (instead of gas), can still be had in Kampar, a dimunitive town straddling the old Kuala Lumpur-Ipoh trunk road. 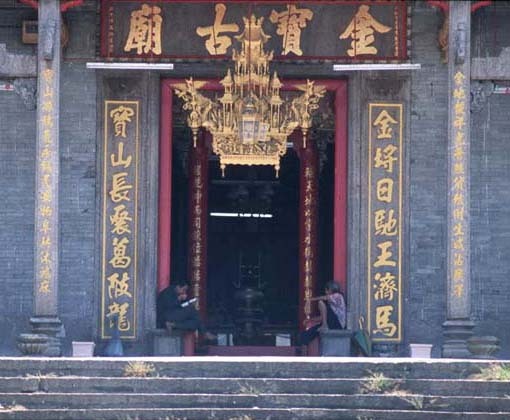 Nestled against a ridge of tree-cloaked hills, Kampar is a compact cluster of shophouses, Chinese clansman guilds (marked by the upright poles in the photo above), and temples, many dating back to the 1880s, when huge tin deposits were discovered in the surrounding Kinta Valley. 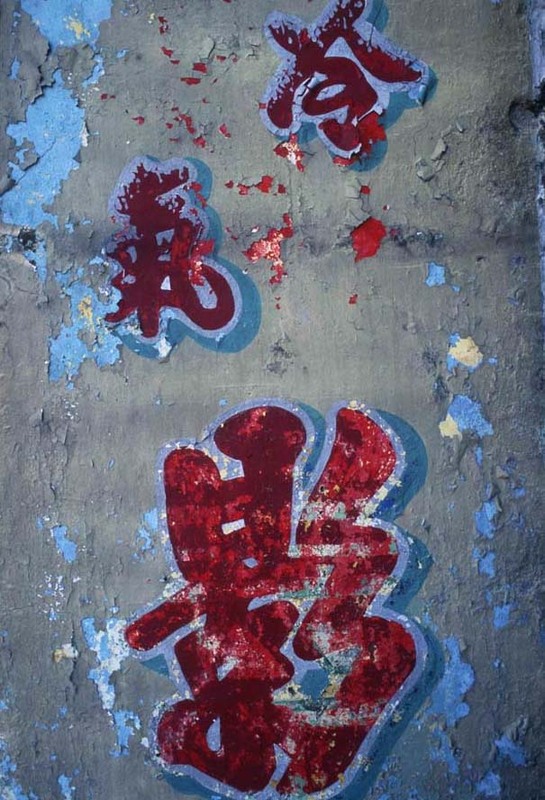 Dubbed "Kam Poh" ("precious as gold") by Chinese who'd come to mine the valley's ore, the town grew by WWII to be the fourth largest city in Malaysia's Perak state. Kampar is rich not only in economic history; in December of 1941 it was the site of a fierce WWII battle in which the greatly outnumbered British and British Indian armies managed to hold off Japanese forces for four days. 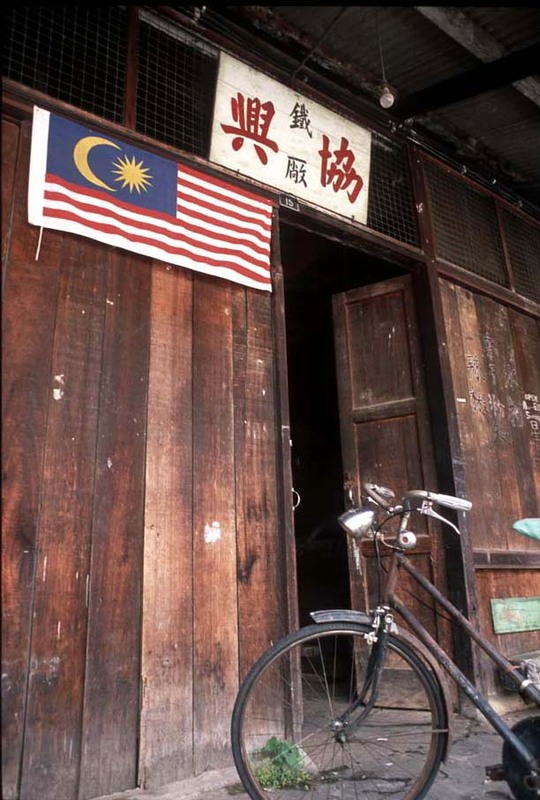 And, surrounded by barbed wire fencing and the site of numerous casualties, Kampar was a center of guerilla strife during Malaysia's Emergency period. 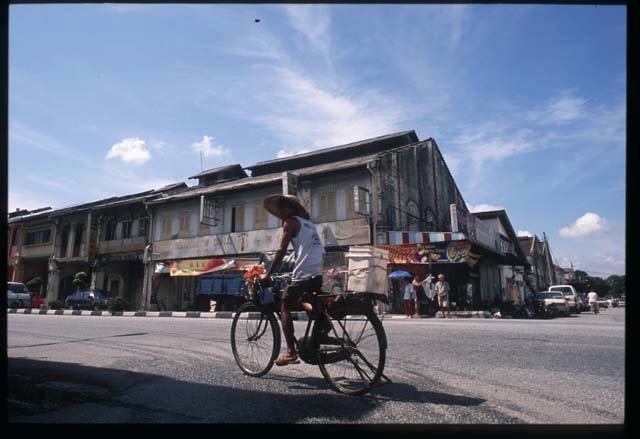 Today Kampar is a relaxed, easy-going town where bicycles are almost as numerous as cars. Everyone seems to know everyone else, yet strangers are treated as friends. While the paint peels from architecturally notable shophouses that lie sadly abandoned along the main street (the characters above advertise an air-conditioned movie house), a university branch recently established nearby promises to breathe new life into the place. 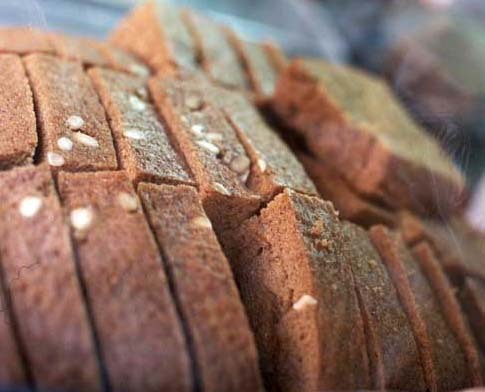 Meanwhile, for established residents social life appears to revolve around Kampar's numerous coffee shops and its enormous open-air food hall. This bustling emporium of gastronomy, pleasantly breezy owing to copious ceiling fans and its situation alongside the Keranji River, boasts some 48 stalls (though on any given day a certain number are closed) serving up everything from curry mee to plain rice porridge. Lively chatter at tables of retirees (ladies segregated from men), housewives toting young children, teens on school holiday, and men at break from work or on their way to the shop makes for a high, but not ear-splitting, noise level. It's a congenial - and appetizing - spot in which to find oneself around breakfast time. We headed straight for stall no. 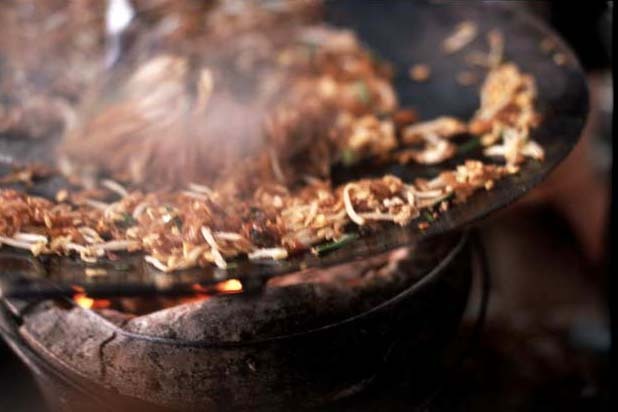 32, where this man has been frying char kuey teow in a huge flattened wok over a charcoal fire - an art he learned from his mother - for over forty years. and, quickly scraping his spatula side-to-side and up and down, with the occasional toss thrown in, mixes them together while incorporating dark soy and chili sauces. Noodles and sprouts are then pushed off to the cooler edges of the pan to wait, while he scrambles a few eggs in the center. When the eggs are nearly firm he brings noodles and sprouts back into the action. 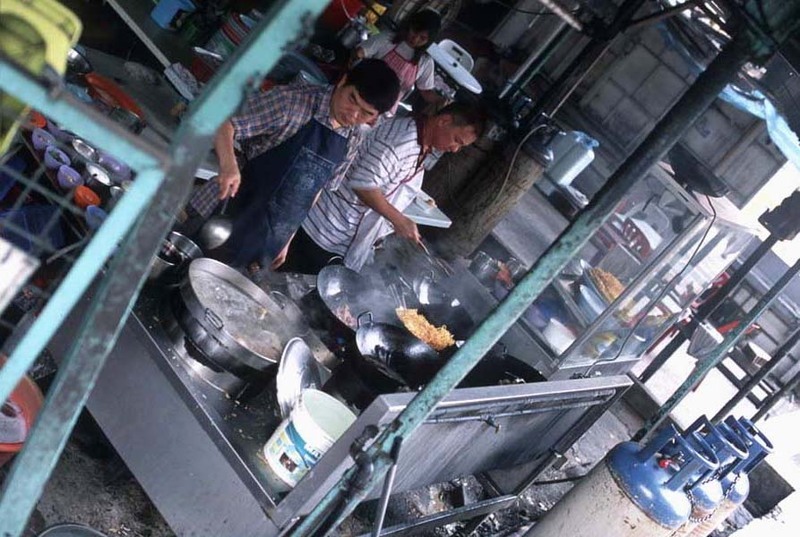 Though our photos don't quite capture it, he's pressing - noodles to pan, eggs to noodles - as much as he's stirring. 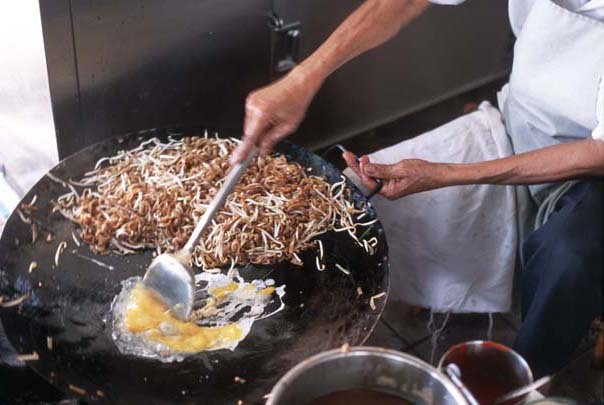 As a local observed while we stood side-by-side watching the master's spatula fly about the wok, it's a technique that results in a perfect integration of eggs and noodles. 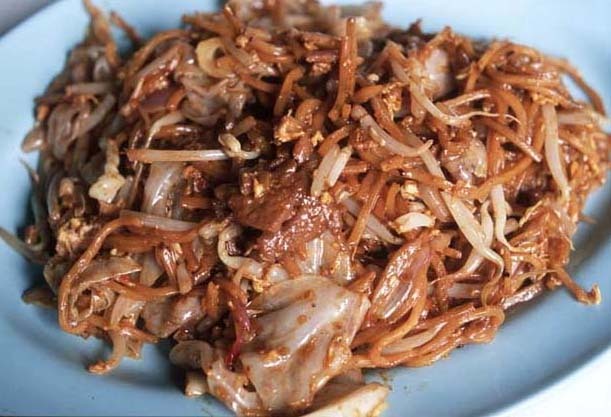 The final product is altogether different from the fluffy char kuey teow I wrote about here. Cooked over a lower heat for a longer period of time, these noodles have absorbed more sauce and are consequently a bit "wet" and heavy, which works well with their exceptionally deep, smoky charcoal flavor. 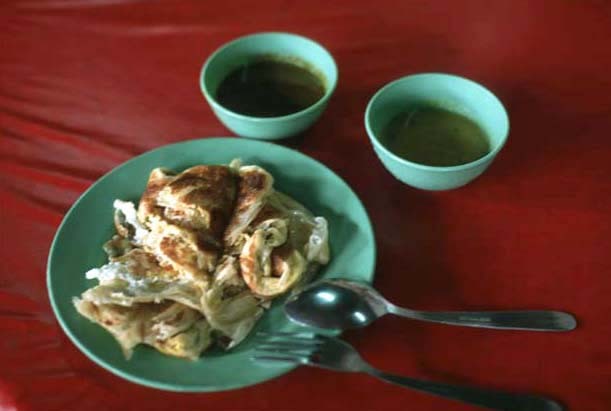 This char kuey teow contains no shrimp, only sweetly briney cockles, and plenty of them. 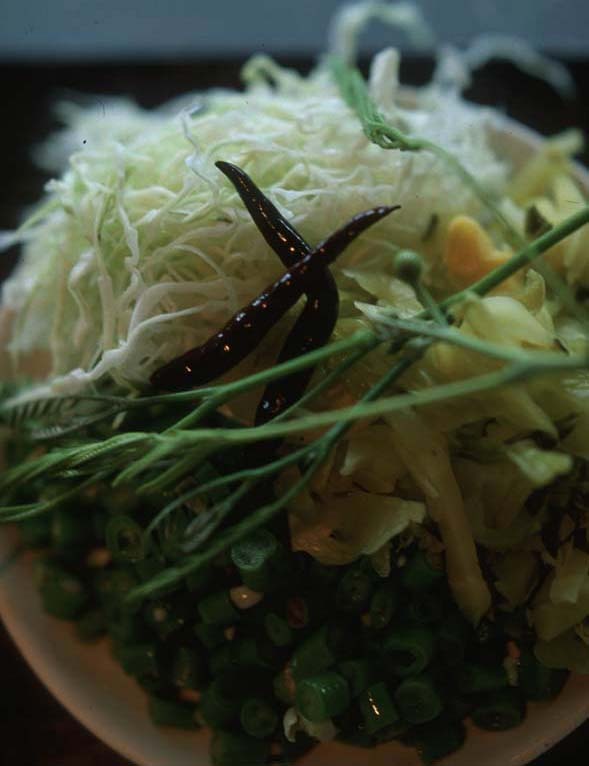 More bean sprouts thrown in at the very last minute are a nice touch, a bright, light ,and fresh note. Sambal served on the side was as fiery as I like it, but this plateful was so fine I didn't want to sully the flavor with any add-ins other than a squeeze of kalamansi. In my book this dish - and the opportunity to observe its unusual preparation - justified the hour and forty-five minute drive. 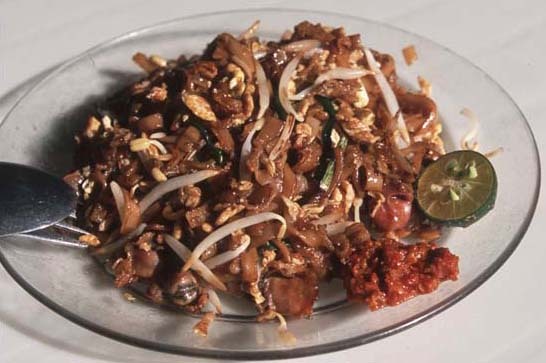 But why stop with char kuey teow? We didn't, stepping just across the aisle to stall no. 45 for an order of wantan mee that came highly recommended by an elderly char kuey teow bystander. while the other stuffs wantan. Ordered dry, mee are mixed with a mixture of broth and soy sauce, mounded on a plate and topped with bean sprouts, tender chicken breast pieces, slices of smoky BBQ pork, and sliced scallions. They're just as a mee of this type should be: springy, with an ever-so-slight, barely detectable "crunch" - al dente but not quite as Italian pasta connoisseurs understand the term. 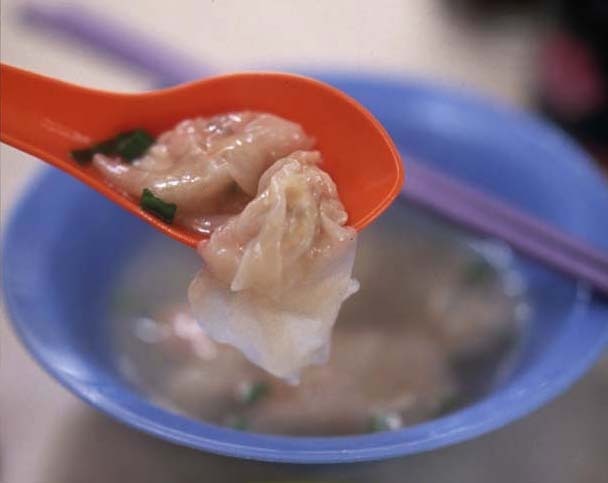 Served in a rich chicken and meat broth sparked with white pepper, the wantan (three each of prawn and pork) are small, with thin, nearly translucent wrappers. Despite their delicacy the gossamer sheets of dough resist dissolving in the hot broth, holding their shape all the way to our mouths. In flavor and texture these wantan have, for me, set a new standard against which all will be judged. Feeling it time to walk off our noodles and dumplings, we headed for the nearest exit - only to come face to face with a woman preparing hot-off-the-steamer chee cheong fun (stall no. 15). A language barrier may have prevented us from getting the story of her and her specialty -- unlike most of the other vendors she appeared to be well on the younger side of forty -- but it did not hamper our attempt to sample her product. 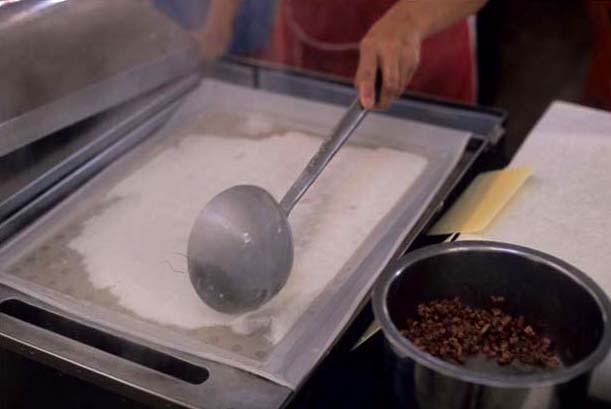 Chee cheong fun (often referred to in English as "rice noodle rolls") start out as a water-thin batter of rice flour, which is ladelled over a muslin-ish piece of cloth stretched over a frame and set over the holes of a rectangular steamer. After batter has been spread on the cloth the contraption's lid (just visible to the left) is replaced. After the dough has steamed for about five minutes the fabric frame is removed and the now firm chee cheong fun quickly scraped onto a smooth work area (to the right of the steamer). 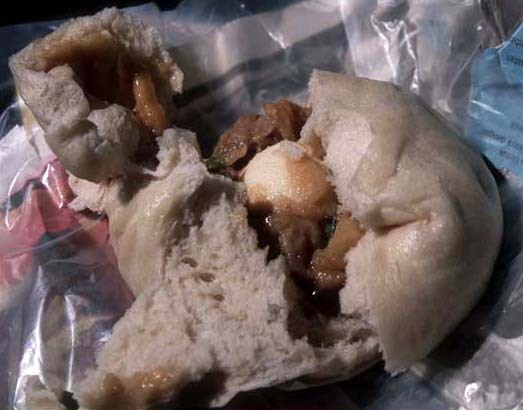 Bits of filling (chopped pork or shrimp, in this case) are dotted in 4 rows along its surface, and then the dough is pushed, with a sort of wide palette knife, from the top and the bottom into two side-by-side dough "logs". They're separated with the knife, placed on a plate, and then sliced. Finally the chee cheong fun are doused with a soy-based sauce; here I detect hints of ginger, five-spice, a meat-based broth. This vendor keeps her sauce warm in a crock pot - a nice touch. Chee cheong fun fresh off the steamer is so different to rolls that have been made ahead of time - wondefully light and airy, almost fluffy. Sambal served on the side was pleasantly pungent with shrimp paste, but I elected to forego it so that tasty combo of fresh rice dough and fragrant sauce could shine through. Stumbling out of the food hall and into the sunshine, we suspected that this time, we might have overdone it. Yet still a whole town of goodies awaited; we weren't finished yet. But this post is. More Kampar to follow, eventually. ... when red lanterns are strung above the streets, a reservation for dinner at a Chinese restaurant and a plane ticket to anywhere are harder to get your hands on than a greased pig, and cries of "Gongxi facai!" fill the air. Yes, Chinese New Year is just around the corner. Happily for Dave and I, it's also the time of year that Malaysians give gifts of homemade goodies. The treats above were made by the mother-in-law of one of Dave's colleagues. 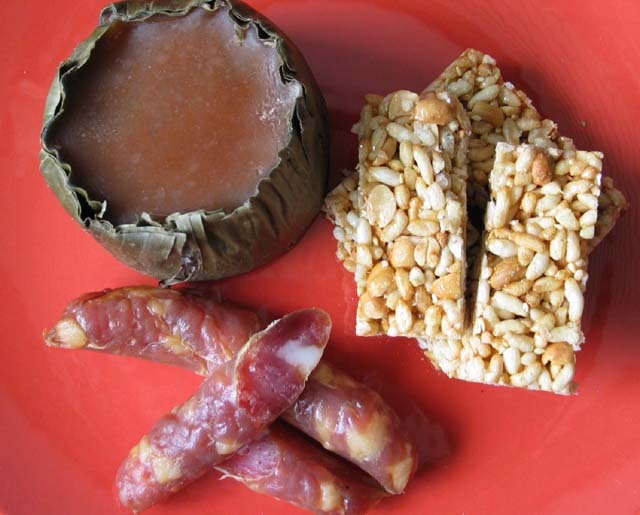 Clockwise from top left, we have nien kou (glutinous rice cake wrapped in banana leaf), mei chang (puffed rice and peanuts bound together with melted sugar), and lap cheong (Chinese dried sausage). I'm acquainted with nien kou (nian gao in Mandarin) from Shanghai where, in the form of a firm, one-inch diameter "cake" of pounded, unseasoned glutinous rice, it's sliced and stir-fried with pork shreds, greens, and garlic. 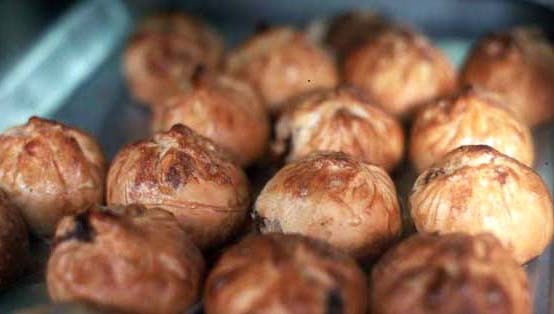 The nien kou pictured above, however, is a food specific to this time of year. 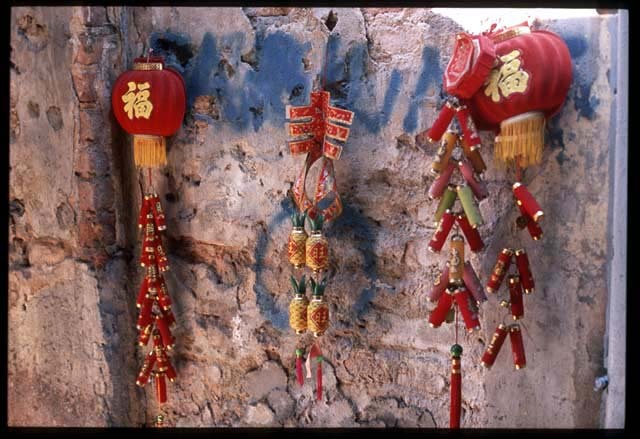 Traditionally offered to appease the kitchen god, it now also represents wishes for advancement in all aspects of life (career, education, salary, savings) during the coming year (nien = year and kou = high or tall). Though mei chang are available year round (we purchased a variation on the theme, made with dark smoky palm sugar, in Kota Baru), they and other cookies are especially evident in markets during the month-long leadup to the Chinese New Year, when sweet tooths seem to kick into especially high gear. The rectangles above are a grown-up version of the rice krispie treats of my youth, with the full-on grain flavor of puffed (instead of crisped) rice, a detectable pinch of salt that keeps the sweetness in check, and none of the sticky marshmallow goo. 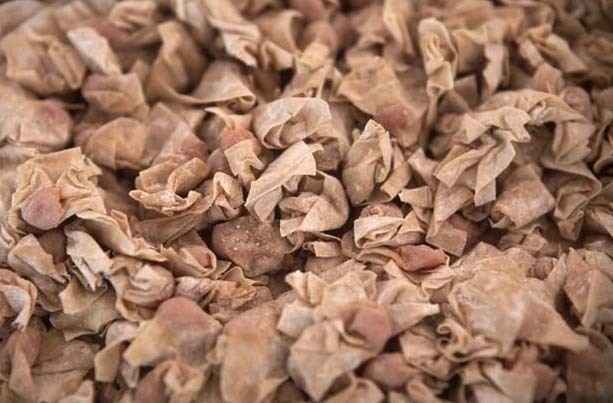 Chinese dried pork links are also readily available throughout the calendar year, but right now Chinese provisions stores are busting at the seams with a larger-than-usual selection, including sausages made from duck intestines and a combination of oysters and meat. They're laborious and time-consuming to make (and contingent on the weather, since they are dried in the sun), so homemade versions are especially appreciated. The ones above are wonderfully porky, lightly seasoned, a bit sweet, and smell unmistakeably of rice wine. I'm looking forward to including them in a simple dish that will highlight their flavor. This morning Z gave us a big bag of rempeyek. 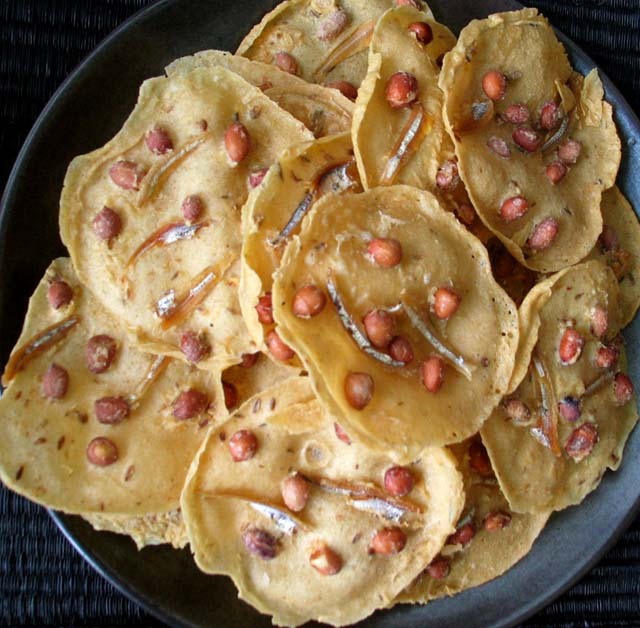 These deep-fried crackers of rice flour are flavored with cumin seeds, fresh curry leaves, and powdered ikan bilis (dried anchovies), and studded with whole ikan bilis (the silvery bits) and peanuts. 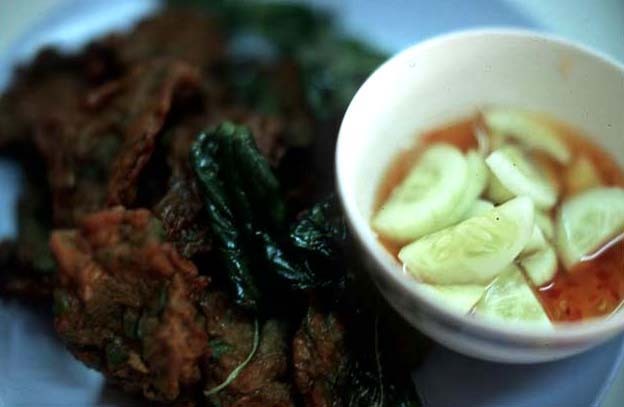 They're fragrant, shatteringly crisp, absolutely addictive, and sure to ruin my hopes of shedding the last of my Malaysian east coast eatathon pounds before the end of the week. 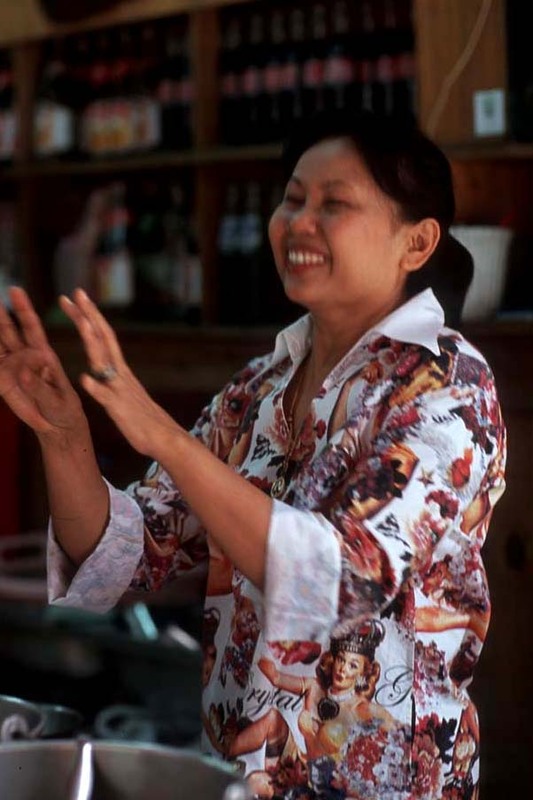 They're also loved internationally; Z's wife, who makes her rempeyek at home for sale, ships the occasional bag or three to customers in Japan. The beauty of it all is that the gifts won't end with Chinese New Year. Mother-in-law (who, by the way, also makes her own rice wine) has offered to show us how she makes her lap cheong after the holiday hubbub has faded. Stay tuned. Is this what La Choy had in mind? And if so, how did they get it so wrong? C'mon - there must be someone else out there with an intimate knowledge of La Choy Chow Mein (beef, chicken, or shrimp), that 1960s and 70s grocery store shelf staple: a two-can (taped together, one on top of the other) quick meal of protein and vegetables suspended in beige-tinted mucus, served over a pile of powdery deep-fried dough worms. It was never prepared in my mother's kitchen (bless you, mom) but in the U.S. I've come head to head with it at the tables of childhood friends, college roommates, and ... grandma (bless you anyway, grandma). 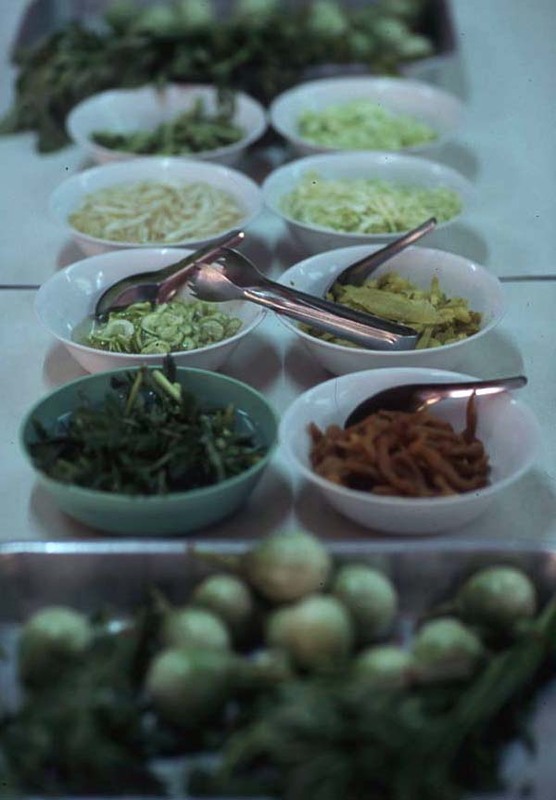 Of course there's nothing inherently wrong with chow mein (simply "fried noodles"), but La Choy meals left me with mental scars that dictated an aversion to the dish. 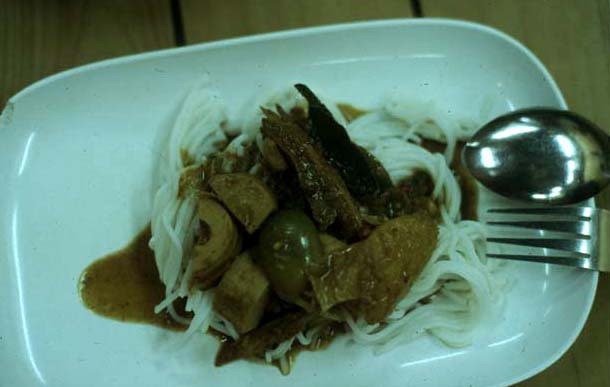 That is until I sampled a particularly palatable pork version in Kuala Terenganu's Chinatown. Since then it's catapulted to near tippy-top of my Favorite Malaysian Noodles list. How wonderful to know, then, that a sublime beef chow mein can be had close at hand, in Bukit Bintang, at a street-level (literally: tables sit several steps down from the sidewalk, which puts the head, once one is seated, at just about exhaust-pipe level) stall that specializes in fried beef noodles, wet (with gravy) and dry (stir-fried a la char kuaytiaow). Before jumping headlong into a recitation of the glories of this no-name place's wet beef noodles, I must acknowledge the merits of the dry version: toothsome noodle, chewy bits of scrambled egg, caramelized but still pleasantly crunchy slices of red onion, lots of crispy bean sprouts and round cabbage chunks, generously sized slices of unbelievably tender beef, and plenty of char from the wok. Altogether fantastic. But would I order it again? Well, no, not if the gravy version is available. 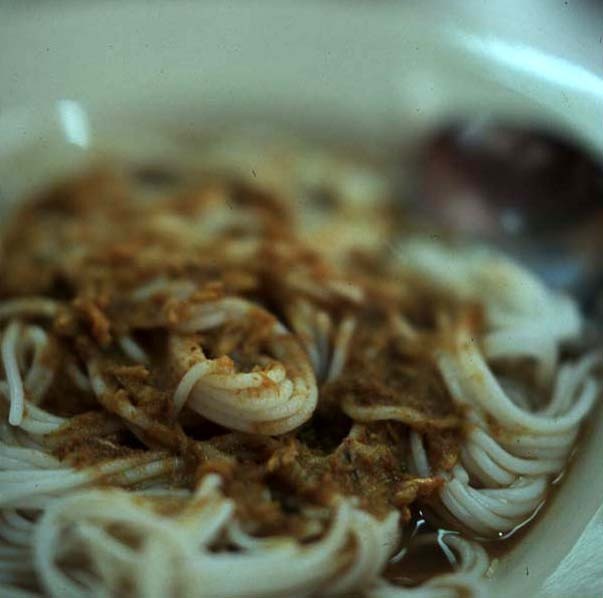 But if gravy doesn't float your boat then the dry noodle is a must-have. Wet noodles feature the same tender beef, but that's where the similarity ends. 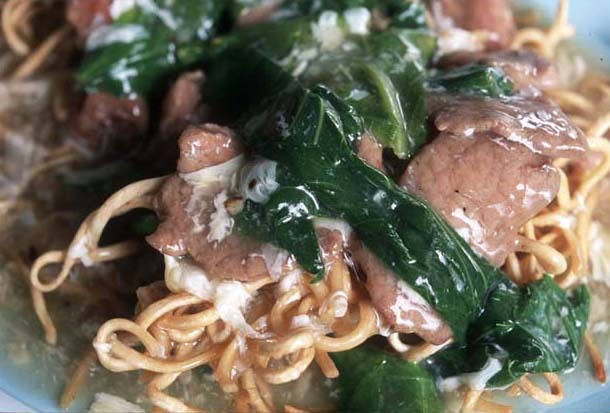 Here we find a plate-sized pancake of thickish noodles deep-fried to a golden brown, cradling a mound of beef stir-fried with gai lan leaves, fragrant with chopped ginger. 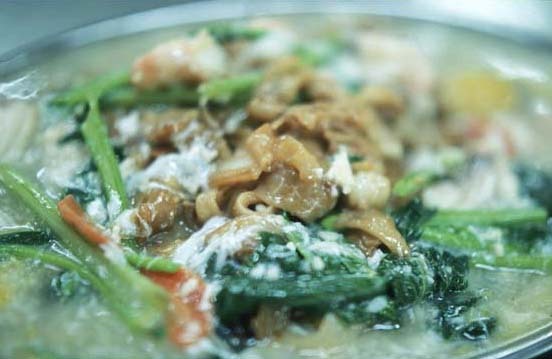 Beef and veggy have been cooked in a broth-scented gravy thickened with egg white and the merest dab of corn starch. 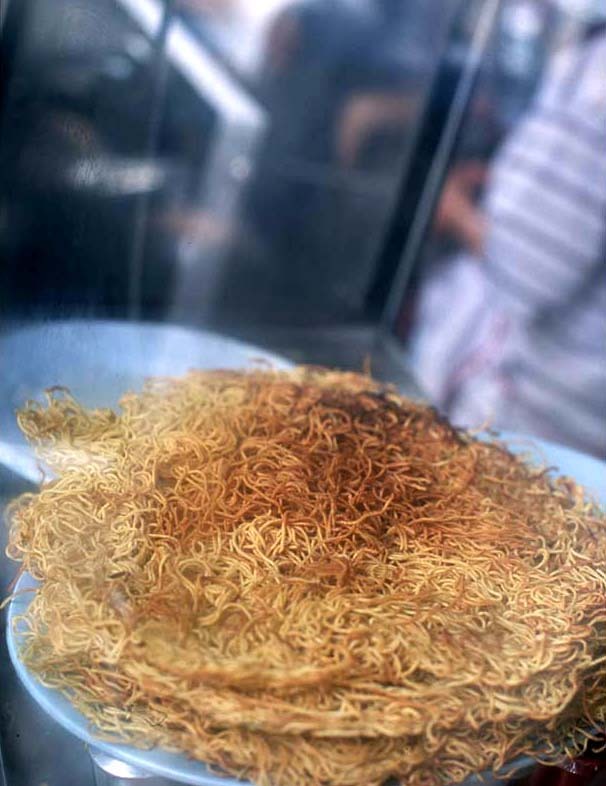 When the lot is tipped from wok onto the plate gravy runs over noodles and pools underneath, laying the groundwork for a textural triumph: a guaranteed combination of crunchy, tender, kinda soft, and not-quite-toothsome noodles in every bite. 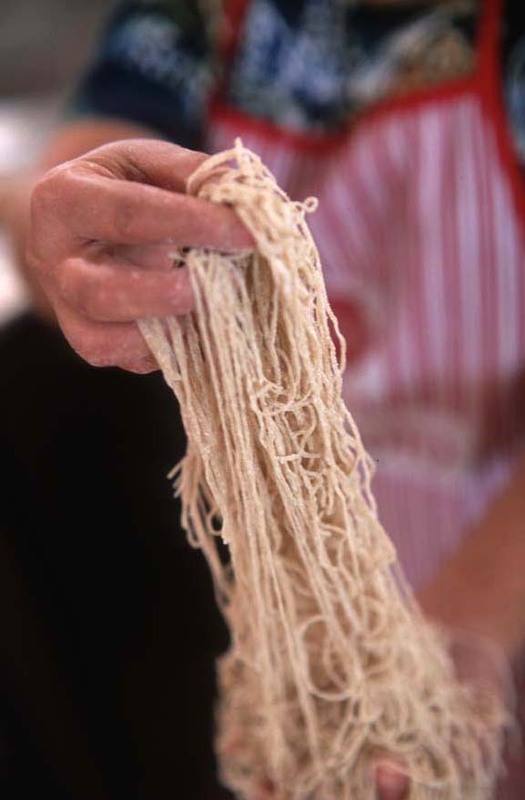 As one works one's way through the dish noodles become more uniformly soft, but never completely so. 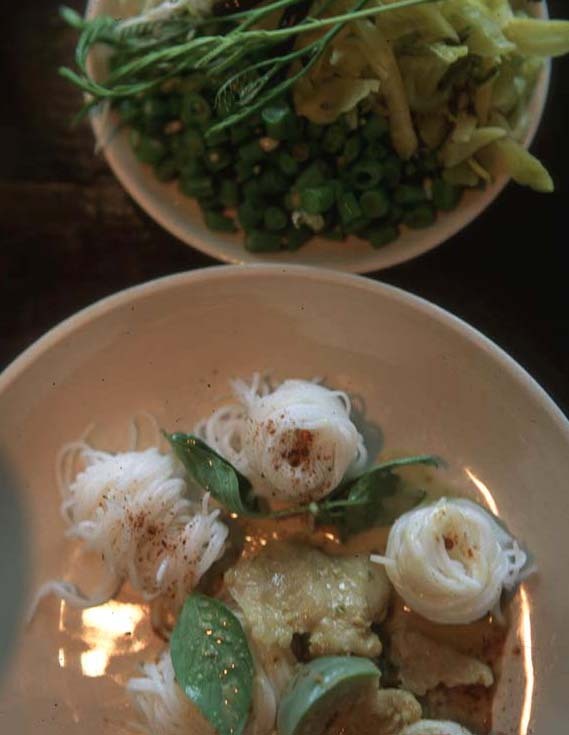 Beyond its textural contrasts, the other standout of this dish is the flavorful, fresh egg white, whisps of which are wrapped around every single noodle. When the noodles are almost gone what's left is a rich puddle of what could be the makings of the world's finest, most eggy (and least cornstarch-y) egg drop soup. In the end, as in the beginning, it's all about the gravy. Update: As of September 2006 this stall has closed. No word on new address, if any. 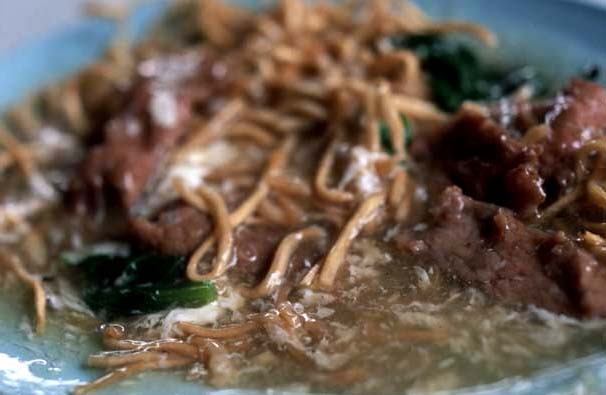 These beef noodles will be sorely missed. No Name stall. Kitty korner to the char kuayteow and popiah shop at the end of Jalan Alor, just across from the Radius Hotel. Closed Sunday. 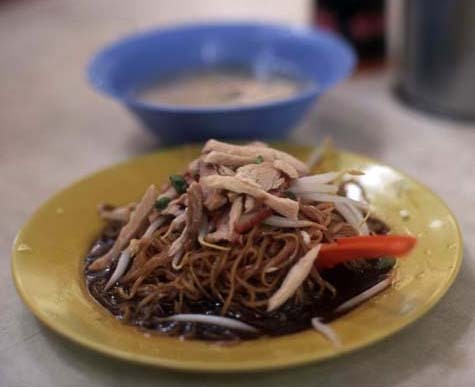 This place is also said to do a fine sang hai mee (sheng hai mian - fried noodles topped with a gravy that includes huge freshwater prawns). Hot and sour soup. Mapo tofu. La jiao. 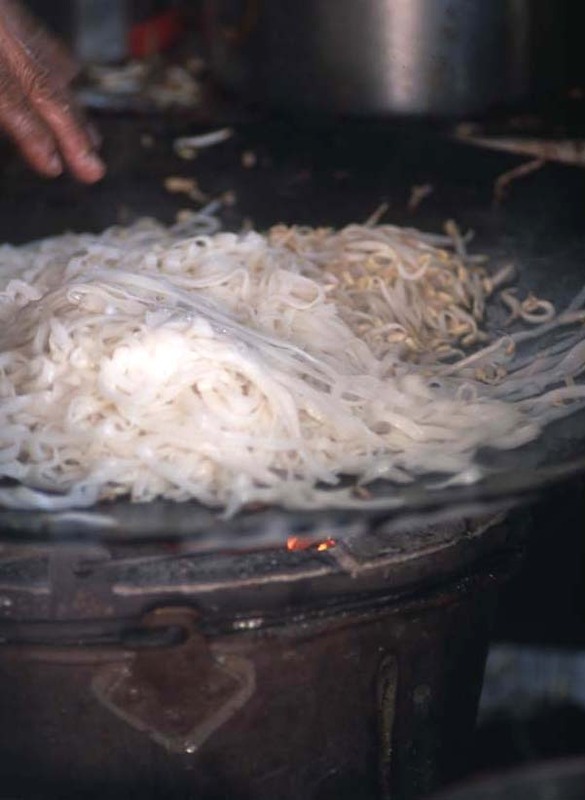 Dandan noodles. Yuxiang pork shreds. Chinese cooks can scorch the tongue and set the lips atingle so well that it's easy (for a chili addict like myself, anyway) to overlook what they consistently do even better: comfort food. 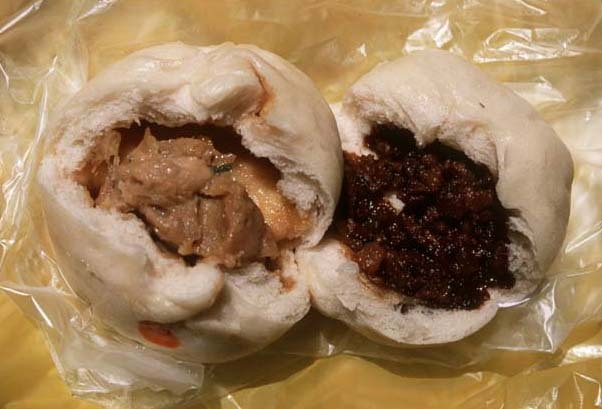 Since moving to Malaysia I've become convinced that when it comes to edible hugs, no one does it better than the Chinese. And for the ultimate in Chinese comfort food, I nominate bak kut teh. 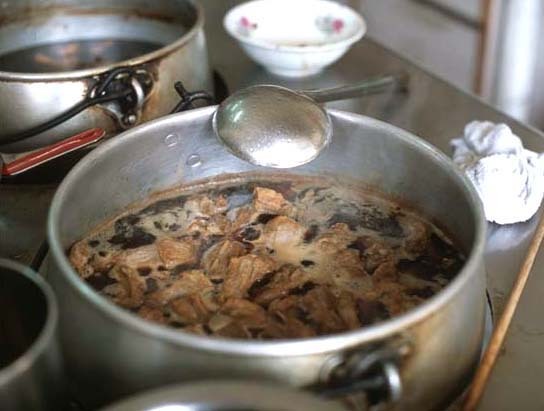 Unappetizingly translated as "meat bone tea", bak kut teh is a Hokkien (from China's southeast Fujian province) soup/stew of pork, spices like black pepper and star anise and cinammon, and Chinese medicinal herbs such as tong sum and kei chee (wolfberries). Now, I've long been of the mind that there's food, and there's medicine, and never the twain should meet. Eating - and feeding others, for that matter - should be about pleasure; injecting a medical purpose into a meal just seems wrong. Bak kut teh boosters make some pretty incredible assertions about this meal-in-a-claypot: it's alleged to cure stomach flu, prevent rheumatism and cancer, boost the immune system, strengthen bones and kidneys, and generally rid the body of toxins, among other things. I'm not sure I buy into the medical legend, but there's no denying the dish is delicious. 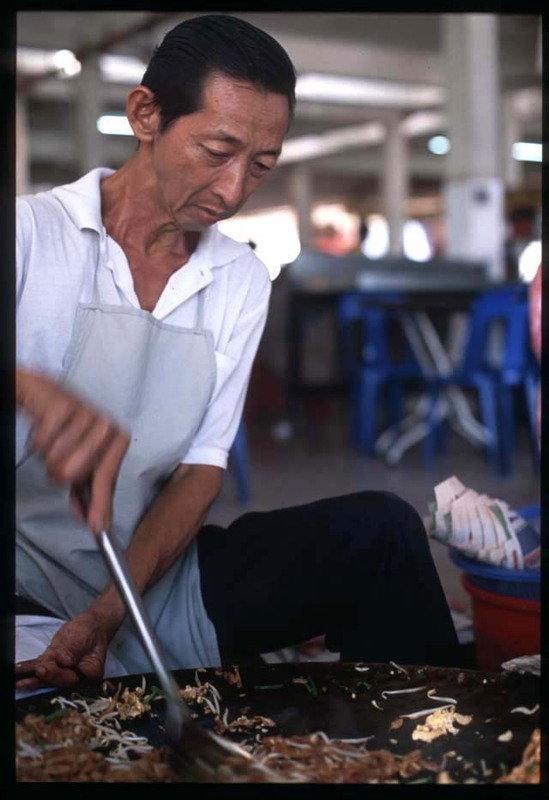 I first encountered bak kut teh on Christmas Day in, of all places, Kuantan. On this last evening of our Malaysian east coast eatathon Dave and I were recovering from a grueling 5-hour drive from Kota Baru, most of it in a monsoonal downpour. Neither of us could summon the energy to set off in search of the seafood for which Kuantan is famous, and so we ended up wandering the city's shuttered downtown in search appetizing sustenance. The sign at this simple storefront, with its unmistakable claypot illustration, beckoned. 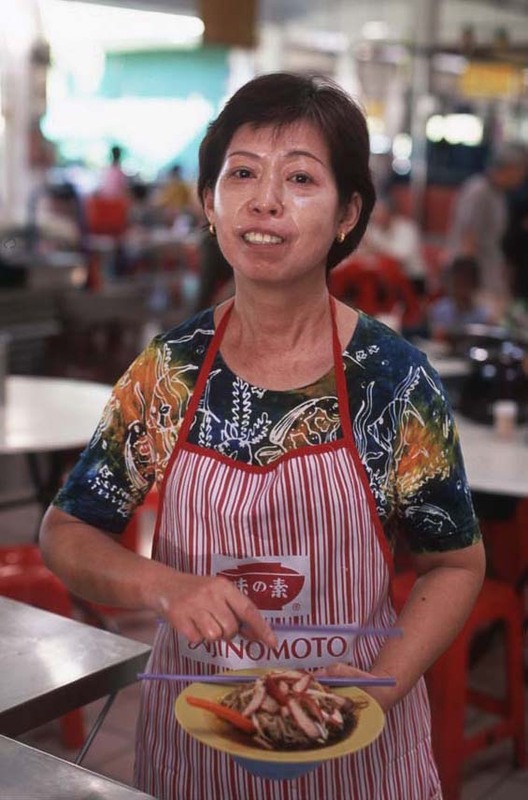 The owner of this shop wouldn't tell us which herbs and spices she includes in her bak kut teh, and my indelicate palate could be certain only of the presence of white pepper, cinammon, and clove. 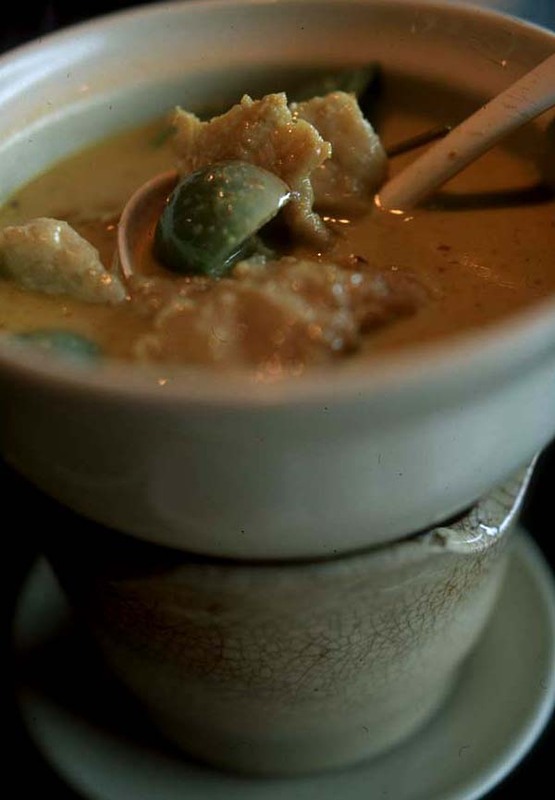 Five hours of simmering produces a complex, rich broth and pork meat that falls off the bone in tender shreds. In addition to bone-in pork, our claypot included reconstituted dried tofu, fried tofu cubes, and four or five chewy dried shiitake mushrooms, and was crowned with a clump of raw enoki that softened in the broth's steam. Lightly spiced but not bland, simple but not boring, this bak kut teh was as addictive as a bowl of thick-cut, kettle-cooked potato chips; when Dave and I finished not a single drop darkened the bottom of the clay pot. 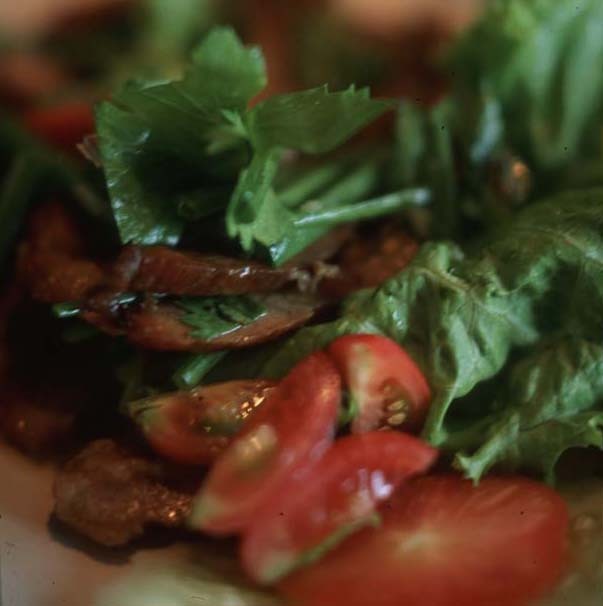 (Delectable also was the shop's velvety soft hot and sour mustard greens, cooked overnight and available only on Sundays and Wednesdays). Having entered the restaurant exhausted, we left - despite our full bellies - revived, uncertain whether to credit the restorative powers of Chinese herbs or the rush of culinary discovery. 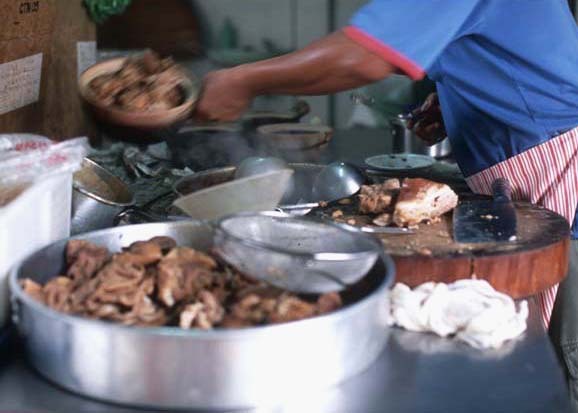 In Malaysia (the dish is common in Singapore as well) the origin of bak kut teh can be traced to Klang, a town about 30 km southwest of KL. 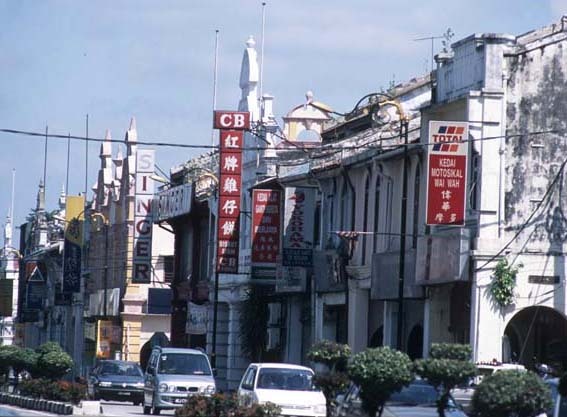 Capital of Selangor state until 1880 (when it lost the title to KL) and once center of one of Malaysia's most important tin-mining regions, Klang, starting in the 1800s, attracted huge numbers of employment-seeking southern Chinese immigrants, including natives of Fujian. 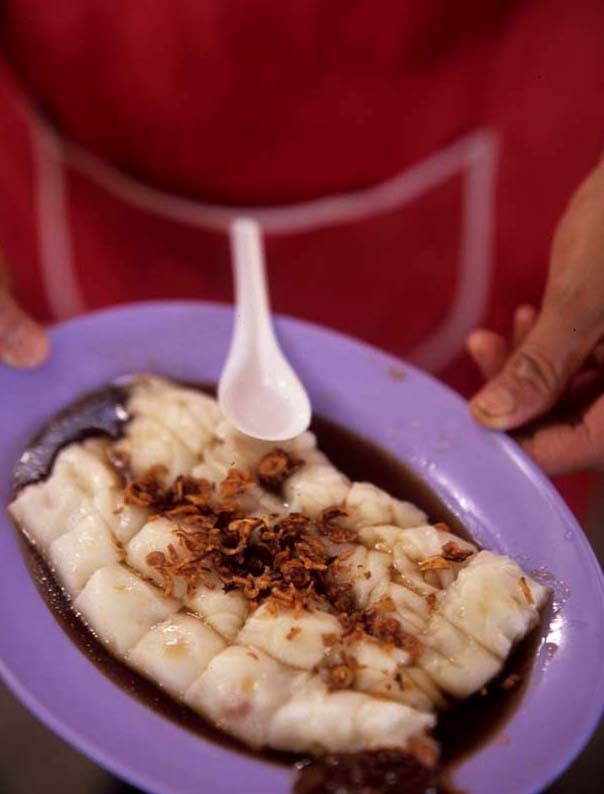 No Malaysian can pinpoint Klang's bak kut teh ground zero, but few dispute that this bustling town is the place to go to sample the best. 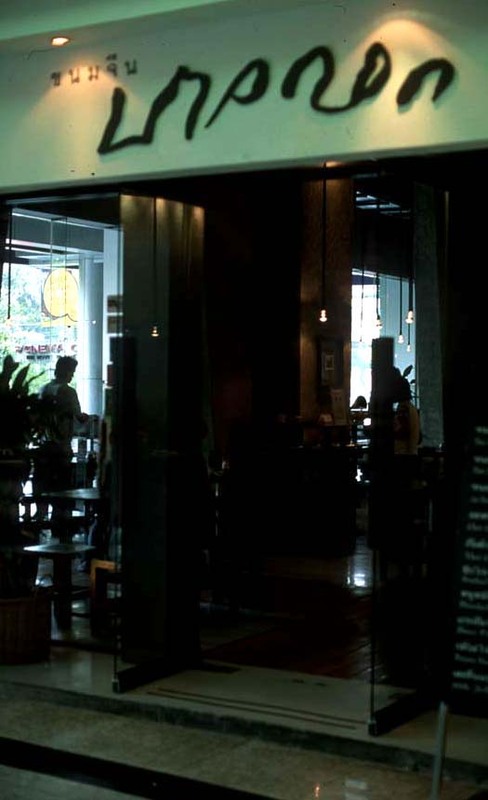 As new devotees, we were eager to dine on bak kut teh at the source. So Sunday, we took to the Federal Highway and, detailed map in hand (thanks HMG! ), made our way to Telok Pulai Bak Kut Teh. Bak kut teh is traditionally a breakfast and - judging from the number of extended families dining at this restaurant - Sunday brunch dish. We ordered a pot for two, one "veggie", and rice, and snagged a plastic container of fried shallots that was making its way around the restaurant to sprinkle over the latter. A plate of youtiao (fried dough sticks; Chinese crullers), cut into 2-inch chunks, arrived with saucers of diced fresh chili and soy sauce. 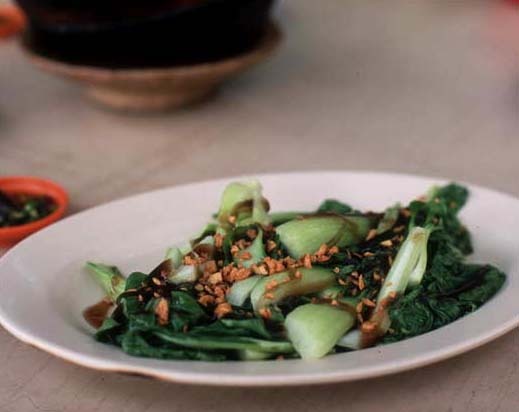 The veggie - baby bok choy, on this plate - is simply blanched, drizzled with oyster sauce, and sprinkled with fried garlic. Well-prepared, delightfully crunchy, but in the end a mere accompaniment to the main event. 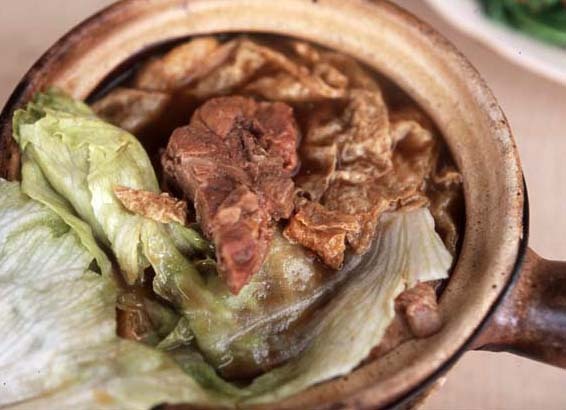 Unlike our Kuantan version, this bak kut teh included three different cuts of pork (thick-cut rib layered with a pleasing amount of fat; lean, boneless loin; and tender pieces of what I'm guessing to be shoulder or rump) and was adorned with several leaves of head lettuce. Mushrooms were few and far between and, in what I would call the restaurant's only misstep, are unmistakeably canned. 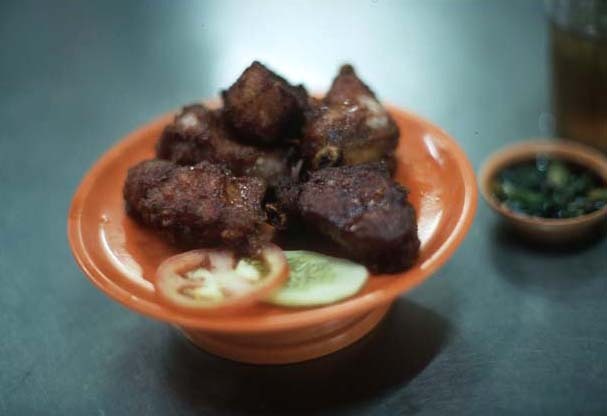 Fluffy squares of deep-fried tofu and a few large sheets of dried tofu (11 to 3 o'clock in the photo) are likeably chewy and soak up the porky broth. It is the broth that, without a doubt, is the highlight of TPBKT's version of bak kut teh. Lushly seasoned, unabashedly fatty, thick with miniscule bits of pork, and as dark as coffee, it would make a fine meal even on its own, without adornments. And it's simply glorious sopped up with cruller sponges. 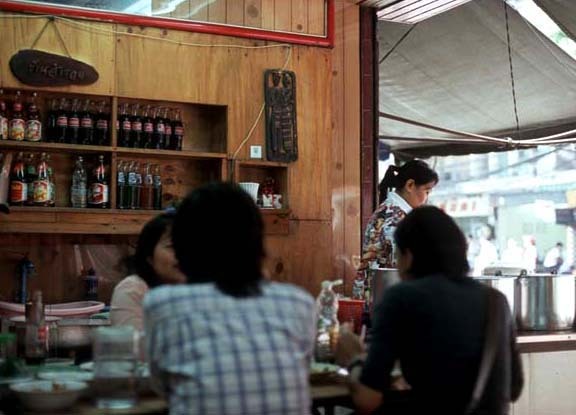 Each clay pot of bak kut teh is assembled to order. As we found out when we ventured back to TPBKT's prep area after lunch, diners can have their bak kut teh assembled not only with specified cuts of meat, but can add on innards as well. 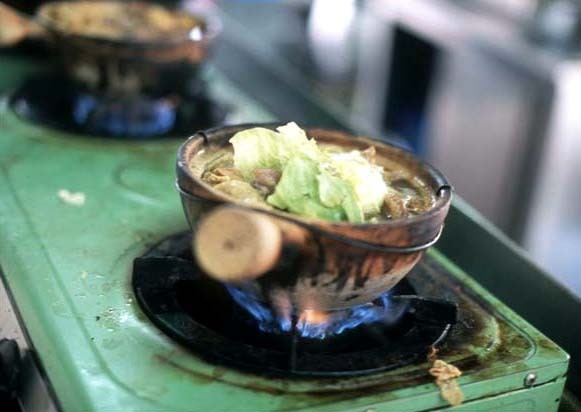 After a pot is packed with pork, mushrooms, and tofu skin it's filled to the brim with broth and set on the fire (opening photo) an brought to a boil. Added to the pot just before it's pulled from the flame, lettuce arrives at the table still crunchy. 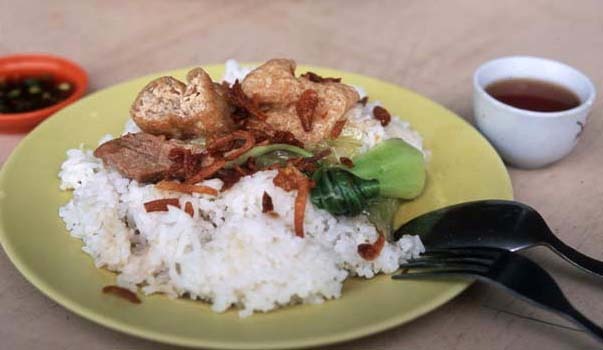 I can't yet attest to the veracity of the medical claims made about bak kut teh, but its pull is akin to that of a drug. I couldn't stop thinking about the dish after my maiden meal in Kuantan, and found myself (someone who prefers chili spice and is not especially fond of hot soups in tropical weather) with a fierce craving for another bowl less than twenty-four hours after our lunch in Klang. Simply put, meat bone tea is a dish that - like the the very best comfort foods - satisfies in every possible way. 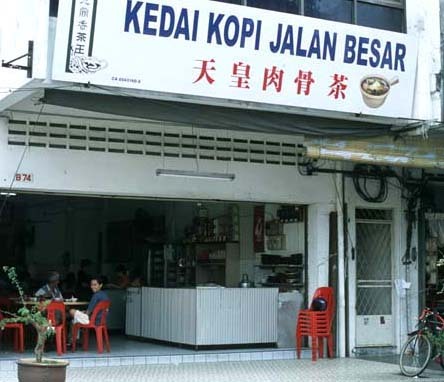 Kedai Kopi Jalan Besar, B74 Jalan Besar, Kuantan. 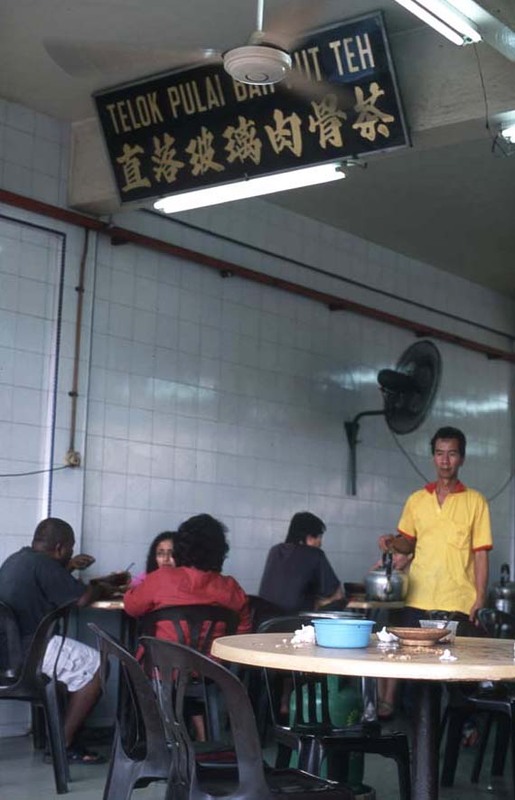 Telok Pulai Bak Kut Teh, Klang. Directions: take the Federal Highway to Klang, continue over the river, and pass an Indian temple on your right. Turn right at the first light after the temple (you will now be in a construction zone). Turn left at the first intersection, pass a field on your right, follow the road to a T-section and turn right. At the second traffic light turn right (you will have passed an Economart on your left). Continue straight and take the overpass (not the small road to its left). 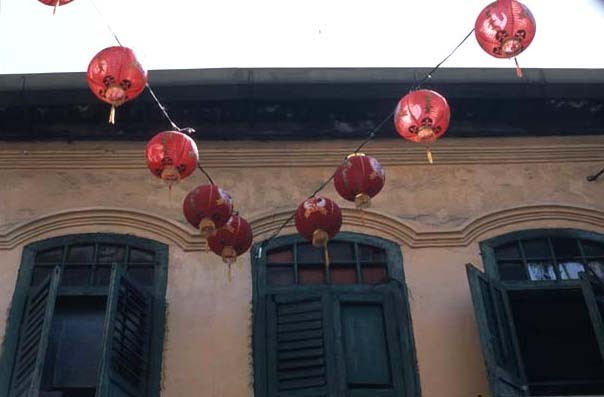 Note a row of shophouses on your right just as the overpass bottoms out; turn right at the first light to enter. 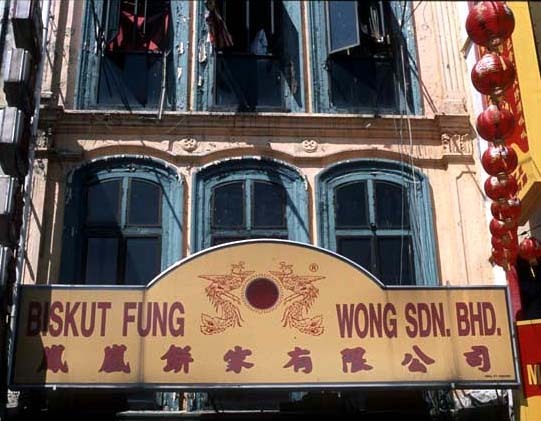 The bak kut teh shop in this post is the one (there are two in the same row) furthest from the traffic light, towards the overpass. Note: For updated, post-road construction directions please see Moo's comment below. Memes, memes, and more memes. The food blogger universe is full of them. They're great, unless you can't think of a darned thing to say. I've just been tagged for a "Sevens" meme by Gerald at Foodite. Since seven is my lucky number AND Gerald recently posted me a super-duper Benriner slicer (my raffle prize from a Menu For Hope), I'm not gonna poop out on this one. 1. Spend a month eating my way around Tasmania (to include at least 1 bowl of mussels per day). 2. Become fluent in Turkish. 3. Learn enough Italian to be able to converse with vendors in the mercado. 4. Buy and renovate a smallish Ottoman yali on the Bosphorus (this will require winning the lottery first, I'm afraid). 5. Put together a guide to southeast Asian food markets, from well-known city markets to more obscure rural markets (photos by Dave). 6. 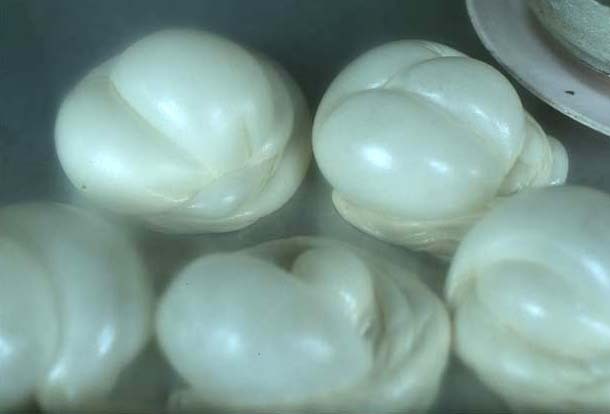 Attend the cheese festival in Bra, Piemonte (mouthwateringly covered in a late 2005 post at Cha Xiu Bao). 7. 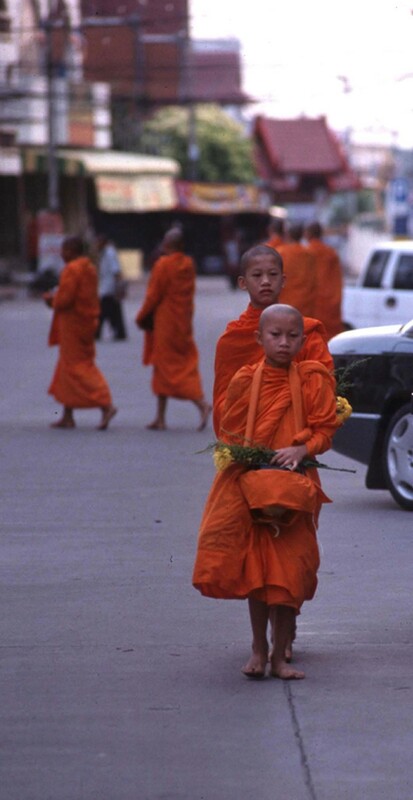 Relearn Thai and live another year or two in Thailand. 4. Remember names and vintages of wines I've drunk, even the incredible ones. 5. Diet (more won't than can't, admittedly). 6. Go more than 2 hours without thinking about food. 7. Stand pretentious food and wine snobs. 1. If he/she can do it, why can't I? 2. It might motivate me to write on a regular basis. 3. It could provide a context in which to display Dave's photos. 4. It surely would relieve friends and relatives of the burden of reading my long-winded, excessively detailed emails about what I ate, where I ate it, and when. 5. It might connect me with other people like me (from the merely food-interested to the seriously food-obsessed). 6. It would prevent me from falling into a rut and eating at the same hawker stalls and coffee shops week after week. 7. It might lead to ... who knows? 4. I mean, give me a break! 5. Got any preferences for dinner? 1. Catherine at Food Musings. 2. phizackerly at Chakrahongkies (I got the Hongkies part but what's a Chakra?). 5. fooDcrazEE at, well, foodcrazee. 6. SweeSan and/or YeeMei at Just Heavenly. 7. I just ran out of bloggers! Roti - it's so been done. At least here. Still, this Kota Baru Old Market vendor's technique is intriguing - and the result flavorsome - enough to merit another post devoted to this snacktime (ie. anytime) favorite. until its surface area has expanded several-fold (and its thickness has decreased by the same measure). It's after the slap-down, when the tissue paper-thin dough is laid back to rest on slick prep counter, that things get interesting. 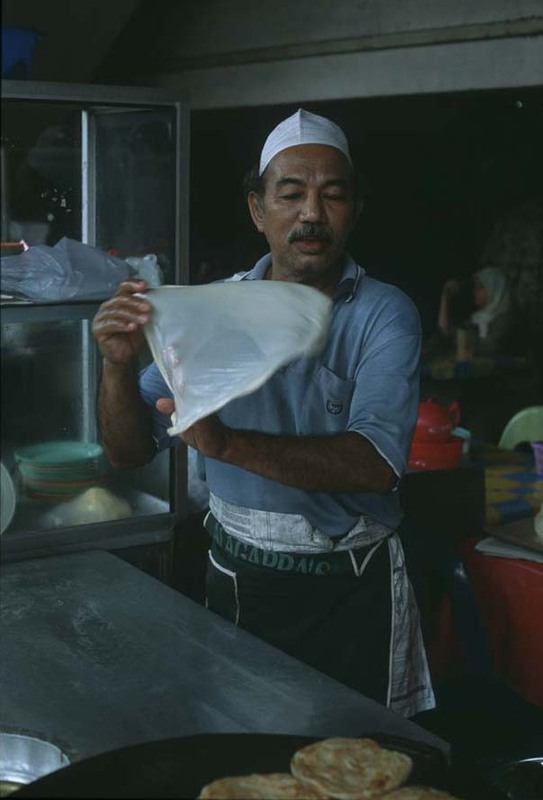 In the blink of an eye, this roti master pinches an edge of dough between thumb and forefinger and pulls it straight up to eye level, simultaneously drawing a small circle in the air to form the dough into a long, twisted rope. Lowered back to the work surface and wrapped around itself, the rope becomes a shiny, dough-encased air bubble (see the opening pic). At this point it's left aside, under plastic, to rest for 5 or so minutes. 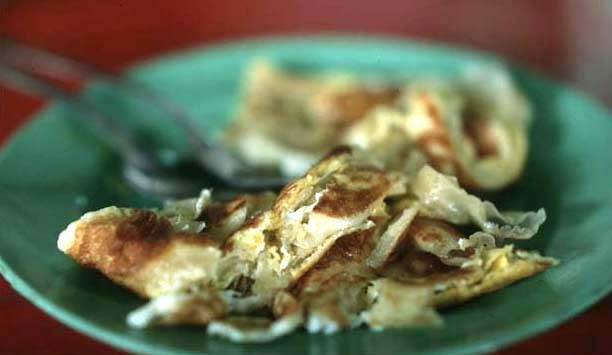 When he receives an order our guy pulls out a bubble, smashes it flat, then pops it right onto the griddle (egg roti, before hitting the pan, are rolled again, drizzled with lightly beaten yolk and white, and folded into a squarish envelope). 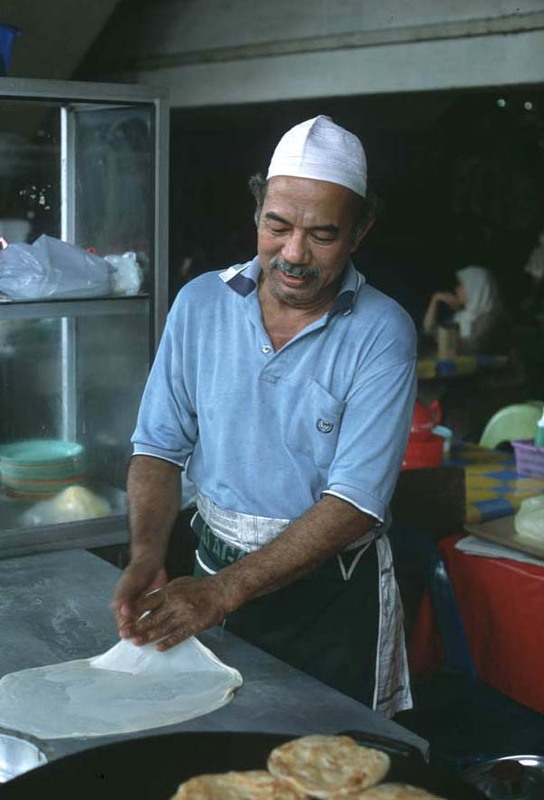 Though we observed other roti vendors in Kota Baru employing the same rope-and-bubble technique, none allowed their dough blobs to sit a bit before griddling. 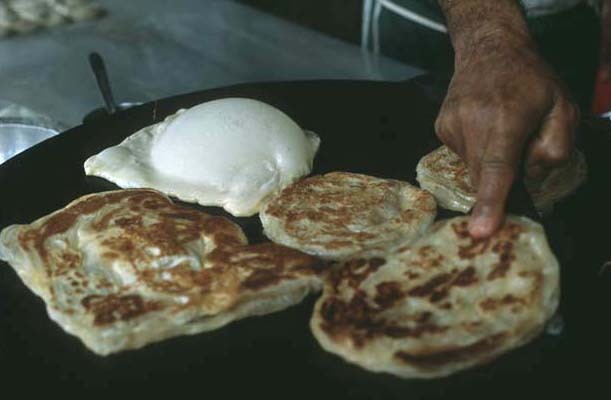 I'm convinced that this master's bubble-and-rest method is the secret to his superbly light, airily layered roti. 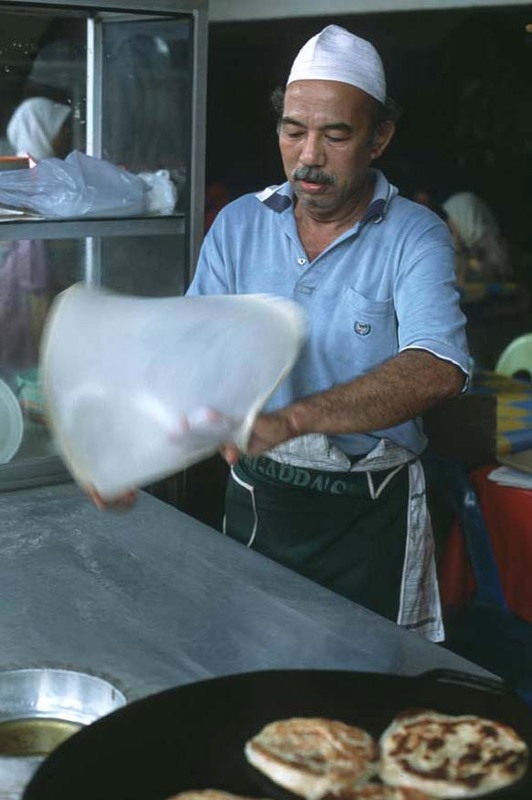 That, and the fact that instead of slicing it with a knife, he lightly smashes each roti between his two open palms, first horizontally and then vertically, breaking it along its natural fault lines. The idea is similar to that which dictates that parmesan reggiano cheese be broken with a chisel, never cut: a break along the natural fissures in the cheese (or the roti) lets the layers speak for themselves. More texture = more flavor. Accompanying daal and curry? Good, I guess. For me, this snack was all about the dough. 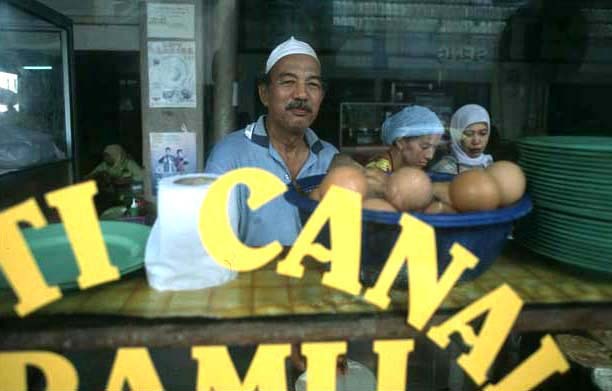 Roti Canai Ramli, on the Jalan Tengku Petra Semerak side of the Old Market (Pasar Besar). Morning to mid-afternoon.